A special Thank you to my friend Catriona for letting me borrow her book! A couple of glasses of bubbly with the girls at a charity do and Poppy's life has gone into meltdown. Not only has she lost her engagement ring, but in the panic that followed, she's lost her phone too. As she paces shakily round the hotel foyer she spots an abandoned phone in a bin. Finders keepers! Now she can leave a number with the hotel staff. It was meant to be! Except the phone's owner, businessman Sam Roxton, doesn't agree. He wants his phone back, and doesn't appreciate Poppy reading all his messages and wading into his personal life. As Poppy juggles wedding preparations, phone messages and hiding her left hand from Magnus and his parents, can things get any more tangled? I've been waiting for a new Sophie Kinsella for awhile now and I was very exited to receive this book in that mail from my friend Catriona! It was so nice of her to let me borrow it! I really liked the preface of this book. Girl finds phone in bin; girl starts snooping the emails in said phone. She basically becomes Sam's PA. I love how nosey Poppy is! I mean, I'd do the exact same thing. I really would ;) She is very real. Poppy is a totally normal girl.I love this about her. She is totally relateable. The plot is fun. There are a lot of funny one liners. Some surprises, but mostly you're waiting for "the thing" tp happen. It is a bit predictable, but I don't necesarily think that's a bad thing. I like predictability. I thought the romance needs to be beefed up a bit. We only really got it at the very end and just a tiny sliver really. Not what I would expect from a Kinsella, but the ending was sweet. just wanted more. 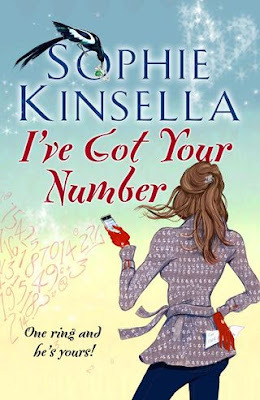 I'd say this is not as good as some of Kinsella's older work, but it is still good. It is a bit more on the serious side, and not as funny. But, there are plenty laughable moments and fun to be had. I liked it! Makes me want to read some of her other books! Did you read it? What did you think? Great review. I haven't read this book yet, but I've read all of SK's earlier books. Her stories are such fun! I read this book last month and I thought it was a fun, quick read. Her books make me laugh! i agree on beefing up the romance. a little more plot development in that department would be nice. i laughed until i cried at the whole singing telegram/beyonce/single ladies episode. it still makes me snort when i think about it! I laughed so much while reading it. I agree on the part where when you read, you can relate to Poppy's amazing personality. I love every funny part, and the quote was totally hilarious... laughing till my tears fall down...LOL. Beyoncé single 'Ladies'. Brilliant! OMG, I love her characters. I think I may have read Can You Keep a Secret? twice! That was back in the days I wasn't buried in books though but I did really enjoy it.